The Avengers: Earth's Mightiest Heroes is a television series on Disney DXD that is inspired by the Marvel Comics Super Hero team of the same name. In each episode, the Avengers defend Earth from unimaginable threats - dangerous Super Villains, time-travelling conquerors, alien invaders and mythical beasts bent on the total destruction of humanity. When the forces of evil are so overwhelming that no single hero has the power to save the world, when no hope is left... the Avengers Assemble! 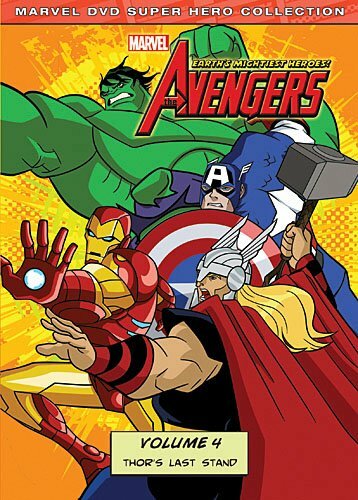 Join Iron Man, Thor, Captain America, The Hulk, and many more of your favorite Avengers as they unite to fight evil when THE AVENGERS EARTHS MIGHTIEST HEROES VOLUME 3 - IRON MAN UNLEASHED and THE AVENGERS: EARTH'S MIGHTIEST HEROES VOLUME 4 - THOR'S LAST STAND arrive on DVD on October 25, 2011. Synopsis: The Avengers: Earth's Mightiest Heroes is a television series on Disney DXD that is inspired by the Marvel Comics Super Hero team of the same name. In each episode, the Avengers defend Earth from unimaginable threats - dangerous Super Villains, time-travelling conquerors, alien invaders and mythical beasts bent on the total destruction of humanity. When the forces of evil are so overwhelming that no single hero has the power to save the world, when no hope is left... the Avengers Assemble! Join Iron Man, Thor, Captain America, The Hulk, and many more of your favorite Avengers, as they discover the value of teamwork and friendship in the fight against evil! The pulse-pounding action continues on October 25th with six unforgettable episodes in the Volume 3 release of The Avengers: Earth's Mightiest Heroes! Enjoy all the thrills as Iron Man, Thor, Captain America, Hulk and the rest of the Avengers face off against Baron Zemo's Masters of Evil and defend earth from a full-scale alien invasion led by the time-traveling Kang the Conqueror! This release follows the April 26th release of Volume 1 & 2 (episodes 1-13) which consumers can still find for purchase at local retail stores. On October 25th, get ready for the ultimate adrenaline rush with Volume 4 of The Avengers: Earth's Mightiest Heroes! In these final seven episodes of Season One, Iron Man, Thor, Captain America, The Hulk and the rest of The Avengers attempt to stop Ultron and his army of robots from ending all of humanity and prevent Loki from unleashing armies from Asgard on Earth! This release follows the April 26th release of Volume 1 & 2 (episodes 1-13) and is accompanied with the October 25th release of Volume 3 (episodes 14-10) which will be available for consumers to purchase at their local retail store. Bonus Feature: The Avengers Unmasked: Hail Hydra! 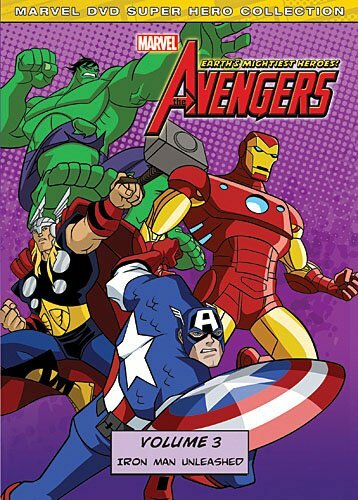 - An animated in-episode comic book experience loaded with fun facts on Avengers and the Villains that challenge them.